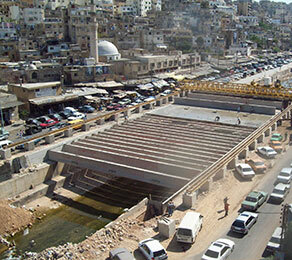 The covering of this important section of Abou Ali River in Tripoli Old Town was part of the Cultural Heritage and Urban Development Project (CHUD) for essential traffic and road improvements. The Cultural Heritage and Urban Development Project in Lebanon seeks to increase the local economic development and enhance the quality of life around the historic centres of five main secondary cities, by improving the conservation and management of the country’s cultural heritage. The project’s main components include the rehabilitation of historic city centres and urban infrastructure improvements that will upgrade public spaces. In the process of improving the Tripoli Old Town roads, it was imperative to cover part of the Abou Ali River over a length of about 300m in a very congested neighbourhood. The covering deck was designed using precast post-tensioned beams. Access to the site was problematic, with only a very restricted area available for site mobilisation. For this reason, CCL proposed a method of construction whereby the deck itself was used as the precast area and the beams were installed using a launching girder that ran transversally along and over the river, supported on rails parallel to the river sides. This construction method reduced the area of activity, whilst minimising the disruption to the neighbouring roads. CCL carried out a design review, the precasting and the prestressing operations, as well as the installation of the beams. Despite delays caused by important military and political events, which occured during construction, CCL successfully completed the project to the satisfaction of the main contractor, the consultant and the client.